Alex Kostich is always smiling before an open water competition. But his mellow veneer hides his very competitive nature. This morning on Kaimana Beach, he will line up with 99 other fast swimmers in the elite heat of the 2.4-mile Waikiki Roughwater Swim, nearly all of them much younger than him. But the three-time winner (1994, 2002, and 2006) is still gunning for #1 overall. 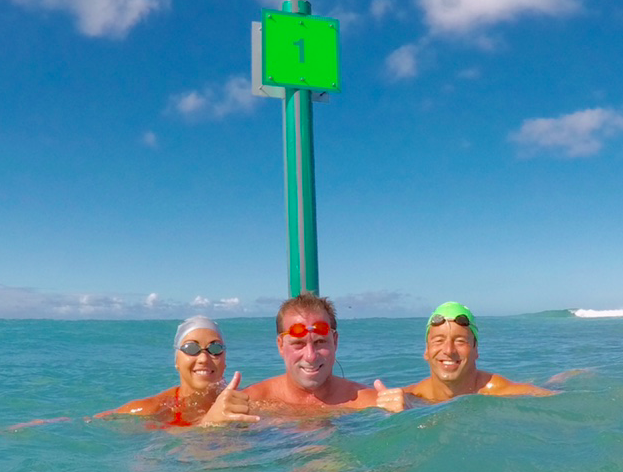 Photo above shows Kostich warming up off of Kaimana Beach with Lexie Kelly and Paul Towers.